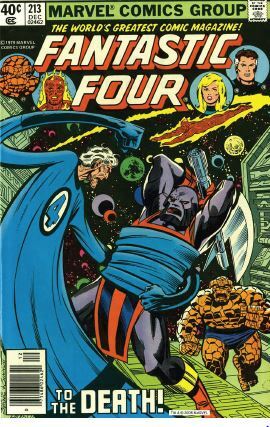 Rereading the Fantastic Four comics from the start. We’re still befuddling our way through the “middle years” after Jack Kirby but before John Byrne. Actually, we do get Byrne in this bunch of issues on inks and occasional breakdowns, but Marvel won’t give him creative control over the series for a while yet. Consider this a hint of things to come. Issue #207: While Reed, Sue, and Ben are in space caught in a war between the Skrulls and the Xandarians, Johnny has gone back to college, where he’s secretly being mind-controlled by an evil genius named the Monocle. As such, the issue begins with a hypnotized Johnny flying around at night committing crimes for the Monocle. We then meet photographer Peter Parker, who was recently fired from working at the Daily Bugle, and gets a staff job with its competitor the Daily Globe. Peter is assigned to take photos at Johnny’s school, where he investigates the mysterious goings-on. That night, seeing the students walk around while hypnotized, Peter transforms into his alter ego, the amazing Spider-Man and takes photos of mind-controlled Johnny committing crimes. He then confronts Johnny, showing him the pics. Spying on their conversation, the Monocle sends the student body to kill the heroes. Johnny and Spidey fight their way to the Monocle’s office, where the Monocle takes over Johnny’s mind, forcing him and Spider-Man to fight each other. Spidey traps Johnny in brand-new fireproof webbing (!) and Johnny gets his senses back. The Monocle flees in his personal rocket ship (which is parked out in the open on school grounds). The Monocle’s mysterious employers, seen only in shadow, promise to retaliate. They then reveal that they’ve taken Medusa prisoner. Issue #208: Out in space, Sue uses her force fields to protect her and her teammates from being killed after Nova mistakenly fired on their ship in issue #206. Nova takes them aboard his ship. Ben recognizes the Sphinx, a supervillain currently working with Nova, and they almost come to blows. The Sphinx senses the presence of Xandar’s living computer, and teleports off the ship. Reed tries to stop him, but then he feels the effects of the Skrull aging ray that hit him a few issues back, making him rapidly get older. On Earth, Johnny uses Reed’s ion ray to teleport him to Xander, where he’s reunited with FF and Nova’s crew. Then, the Prime Thoran, a Xandarian infused with the power of the living computer, declares war on Skrulls. Fearing the ensuing battle will destroy Xandar, the FF and Nova jump into the fray. They’re stopped by the Sphinx, who has also tapped into the computer, which has granted him godlike powers. Everyone fights the Sphinx, which gives Nova’s gang of sidekicks a chance to show off their powers. The Sphinx wipes the floor with everyone, and then announces he will destroy the Earth, because it was his prison for thousands of years. As he flies off, Reed says there is only one person in the universe powerful enough to stop the Sphinx: Galactus! Issue #209: Everyone gathers around Reed as he invents something. It’s H.E.R.B.I.E. the robot! H.E.R.B.I.E. is here to chart courses through space and perform complex calculations at high speed, to help our heroes locate Galactus. Skrull Empress R’Klll withdraws the troops after being defeated by the Prime Thoran (we don’t actually see the battle), and Nova fears the Skrulls are regrouping for a counterattack. The FF encounter a spaceship graveyard and an alien insect named Grogarr. His fellow bugs attack the FF, and he gives his life to save our heroes. The FF survive the battle with help from H.E.R.B.I.E., and make their way deeper into unknown space. 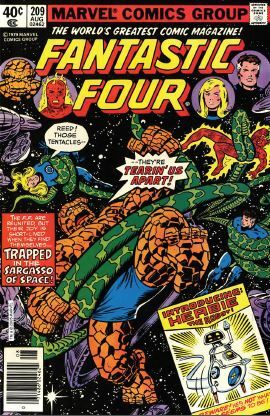 Issue #210: After fighting their way through some asteroids that almost kill Johnny, the FF arrive at Galactus’ ship, the same reality-bending one we saw way back in issue #49. Reed explains that Galactus “metamorphosed” back to life after seemingly being killed the last time we saw him. Our heroes break into the ship and immediately attack Galactus, who barely acknowledges their presence. Reed comes up with a plan. The FF set free all the alien animals in Galactus’ personal zoo (he has a personal zoo! ), which succeeds in getting the big guy’s attention. Galactus says he’s aware of what the Sphinx is up to, and that he made Reed a vow never to return to Earth. Reed says that if Galactus defeats the Sphinx, Reed will allow him to rescind his vow. 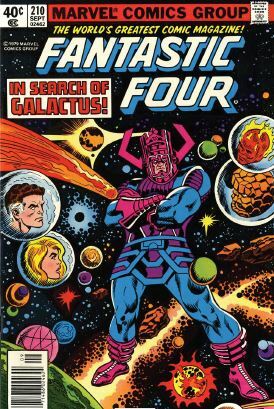 Galactus accepts, and says that the FF must find a new herald for him before he can continue. Issue #211: Galactus teleports the FF (and H.E.R.B.I.E.!) to an alien world, where they’re attacked by robot “Warmen.” They’re taken captive and brought before the planet’s evil dictator, Tyros the Tamer! (“Tamer?”) He threatens to make Sue a part of his harem. 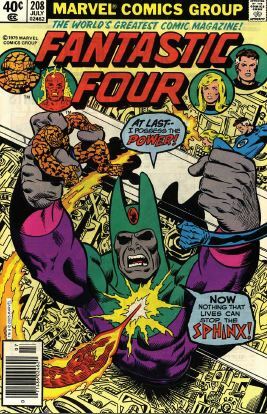 The FF fight him, with the Skrull aging ray showing its effects on Reed and Sue big time. They defeat Tyros and are teleported back to Galactus. Galactus gives Tyros the power cosmic, transforming him into his new herald and renaming him Terrax. Galactus threatens to turn Terrax into a worm if he does not obey, and Terrax swears loyalty to his new boss. Galactus then says it’s time to save the Earth from the Sphinx, so he can devour the Earth himself. Issue #212: After three pages of recaps, Terrax arrives on Earth and fights the FF for a bit. The aging ray knocks Sue unconscious, and Reed, now wrinkly and grey-haired himself, puts her in suspended animation in the Baxter Building. Terrax and H.E.R.B.I.E. search for the Sphinx, who has created a “disturbance” to hide from Galactus. The Sphinx has returned to Egypt, where he flashes back to his origin, and how he gained his magic powers and his immortality. He uses his godlike powers to recreate ancient Egypt in all its former glory. Galactus shows up and confronts the Sphinx. (Galactus actually says, “Sphinx! You speak in riddles.”) On board Galactus’ ship, Reed tinkers with some machines when Terrax returns, threatening to destroy the FF. 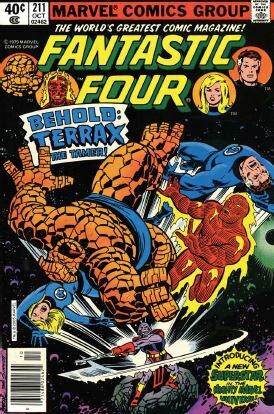 Issue #213: Terrax mops the floor with the FF, knocking out Ben. Galactus and the Sphinx fight, blasting each other with their cosmic energies. Terrax defeats Ben and Reed, only for Johnny to freeze him with “liquid oxygen.” H.E.R.B.I.E. takes Ben to the Baxter Building and puts him in suspended animation next to Sue. Galactus manages to defeat the Sphinx by absorbing all of the Sphinx’s powers. He then sends the Sphinx back in time to the day he got his immortality, so that his “curse” is to live his long life all over again. Reed and Johnny arrive with the Ultimate Nullifier, the weapon with the power to defeat Galactus. The Watcher shows up as well, to observe. Reed says he rebuilt the Nullifier from machinery found in Galactus’ ship. This is enough for Galactus to hear, and he leaves, swearing again to never return to Earth. 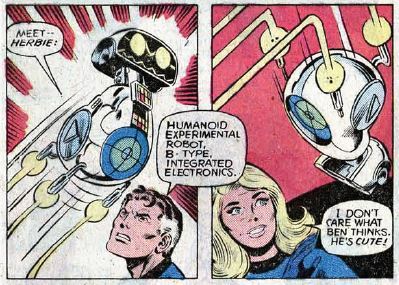 Reed then explains that the Nullifier is a fake, and that the Watcher was bending his “non-interference” rules by not allowing Galactus to detect the truth in Reed’s thoughts. Just when it looks like all is well, Reed collapses. The aging ray has finally done him in. Unstable molecule: Reed constructs H.E.R.B.I.E. from blueprints he had memorized, and using alien tech. Power-wise, he stretches to liquid-like consistency to slip through the Sphinx’s fingers. Fade out: Sue’s quick thinking saves everyone after their spaceship blows up. 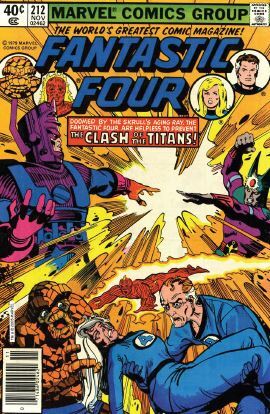 Clobberin’ time: Although we were told a few issues back that Ben had gotten stronger, he spends these issues getting the crap beaten out of him, by the Sphinx, by Terrax, and even by those Warmen guys. Flame on: Johnny experiences quite a malaise in these issues, questioning his place in the world. He wonders what his life and his identity might be without his powers or the FF. Fantastic fifth wheel: Freakin’ H.E.R.B.I.E. the robot. H.E.R.B.I.E. was created for the 1978 Fantastic Four Saturday morning cartoon. 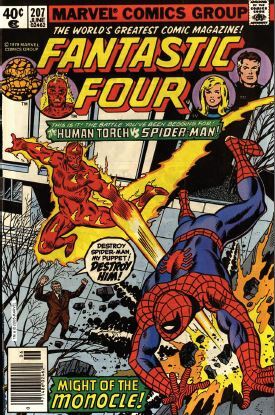 A different company had the adaptation rights to the Human Torch, so H.E.R.B.I.E. was created as the Torch’s TV replacement. (Stories about producers not including the Torch for fear that children might set themselves on fire are not true and have been debunked several times.) These issues even address the fact that there’s an FF cartoon, which also aired in the Marvel Universe. Johnny says he’s not on the show because he wasn’t there the day the contracts were signed. The subplot about Medusa being kidnapped won’t be mentioned again for a long, long time. 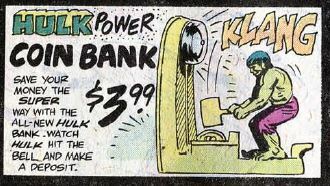 Commercial break: Save money with the Hulk! Trivia time: Spider-Man leaving the Daily Bugle and joining the Daily Globe kicked off an ongoing subplot for him, which is odd that it happens in the pages of Fantastic Four instead of his own comic. Fantastic or frightful? There’s a real Star Trek feel to these issues, with an “in each episode we visit a different crazy planet” structure. Galactus is written much more in character than in his last few appearances, the Sphinx turns out to be a credible menace, and Spidey/Torch team-ups are always great fun. All that business with Nova and the Xandarians fighting the Skrulls just gets left behind, as if the writers forgot about it. So, a mixed bag of issues overall.